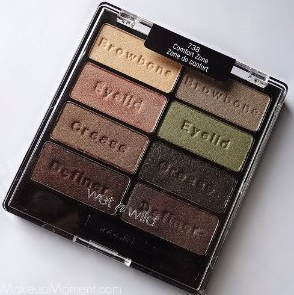 Before I begin, you have probably notice that there are a couple of shades missing from my Wet 'n' Wild 'Comfort Zone' palette. However, unfortunately somewhere in transit, two of the shades shattered. Now, I wouldn't normally be too bothered but it was the olive green and the ivory cream colours that I was most looking forward to using which is just typical but there are so many other lovely colours to work with that I guess I can get over it! and a set of green shades which are all soft and easy to work with, there is a little fall out but nothing compared to the Urban Decay shadows. The colour pay-off is fantastic and all of the shadows are highly pigmented, I wouldn't say that there is a duff shade amongst them. The shadows also wore well on my eyes throughout another hot and sticky day in London with minimal fall out at the end of the day and most of the shadow still intact. Have you ever tried eye colour from Wet 'n' Wild?